For the most part, I can recognize most things on menus when I go out to eat. Even when the names or terms are unfamiliar to me, I can usually draw some kind of parallel to something Iâ€™ve had before, something with which I can relate. It is rare that I get to try something completely new, with no precedent, no context in which to make it familiar. This past Friday night, I tried panipuriÂ at Peopleâ€™s Eatery. I had no clue what to expect, despite having done a quick search on Wikipedia prior to ordering the dish. The little Indian-inspired snacks that emerged from the kitchen were divine, and I woke up the next morning craving them, again. 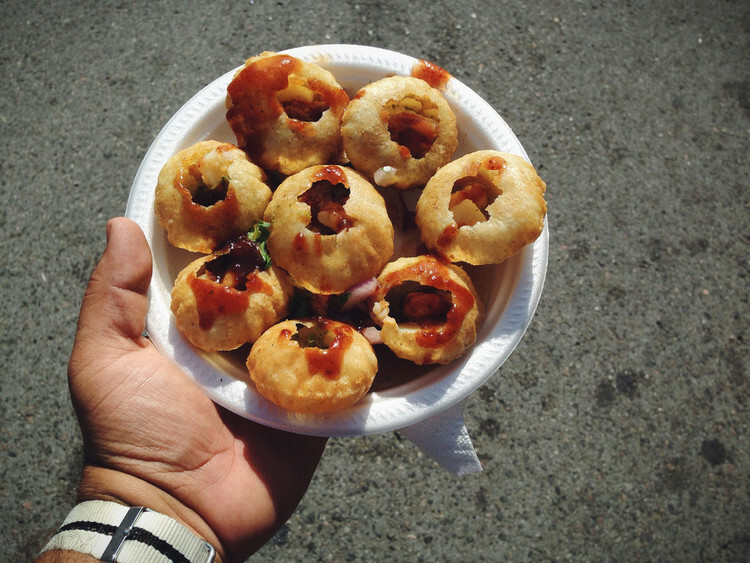 Yesterday, L and I visited the Festival of South Asia, and once again got an order of panipuri. These were different than those from Friday night, but they were just as delicious. I am craving them again, already. Itâ€™s nice to know, sometimes, as we go through lives with some sort of general routine, that we can still be wholly and completely surprised, whether it be with food or any other kind of experience; it is wonderful to try something completely and utterly new and feel a small sense of wonder, from time to time.